Boba Fett was a happy accident. Originally intended as just one of several bounty hunters in The Empire Strikes Back, the character -- designed by the legendary concept artist Ralph McQuarrie and storyboarder Joe Johnston, who'd go on to direct The Rocketeer and Captain America: The First Avenger, after a cartoon version in 1978's notorious Star Wars Holiday Special -- parlayed his stealthy appearance in the 1980 movie to a key and lucrative part of George Lucas' universe. 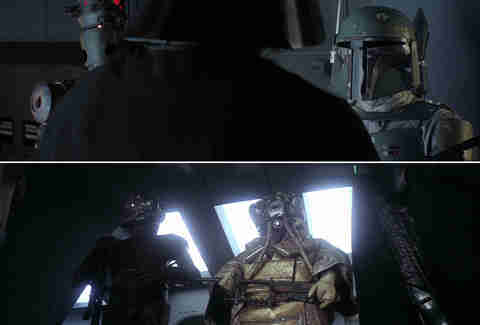 The prequel trilogy hinged on Fett's lineage and can be held up as a rare moment of fan-service backfire, but not even Attack of the Clones could dent the bounty hunter's helmet for good. There's just something about that Mandalorian mercenary of few words. 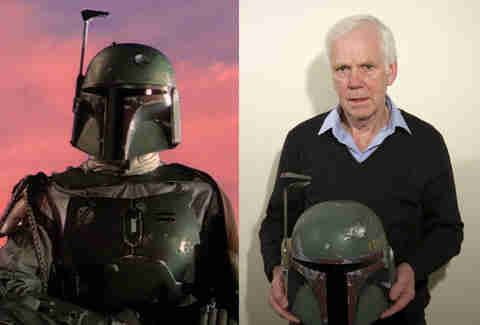 Fans can thank Jeremy Bulloch for that. Now 71, the British actor inside the suit continues to make the rounds at Star Wars conventions today to keep the spirit of Boba Fett alive. Bulloch is one of a handful of subjects profiled in the new documentary Elstree 1976, which explores the lives of the actors and extras involved with Lucas' original Star Wars trilogy. 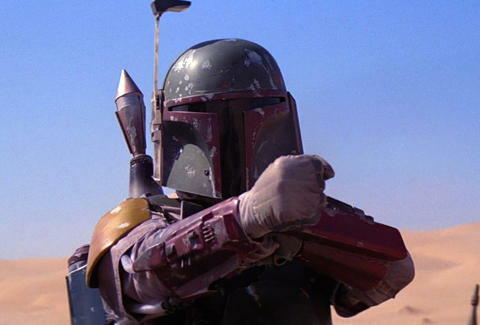 With the movie out in theaters and on demand, we asked Bulloch to reflect on Boba Fett, just in time for "Star Wars Day." May the 4th be with you. Not a day goes by without people emailing saying, "We have a convention, Mr. Bulloch, in Glasgow. We'd like you to come along and present." That makes you feel proud. You go, "Oh, they're going to choose me! Oh, that's nice." I think I'm a very lucky person, in that I was asked to do the part and I fit. I always say, "Look, I fit the outfit!" They didn't have to start cutting things and sewing things up. And if they're not going to see your face -- which I thought was awful, I was hoping I was going to be seen -- but as they don't see my face, well, it could be anybody, so that's fine. I'm lucky. I don't think you should ever see his face. You see him as a youngster, but later on, you shouldn't really see his face because it's that lovely thing, you don't know what's going to happen. He keeps moving forward slowly, what's going to happen? And just to keep that sort of tension is far better. But could he see through the damn thing? You could see through, but breathing in it... it started to mist up. I remember counting steps: "one, two, three, four, go to your right." I had to count the steps I had because it's not easy to walk about, and when you breathe in, it just mists up. And yet you have to try and look as cool as possible. I'm a giggler -- when you're on stage a lot, you know, you start to laugh. But, no, definitely, just that little nod of the head. Serious stuff. Lot of power coming through. I think they did it twice: a thing of [me] standing there and just the nod of the head, and then another one, you do it a little bit quicker. And I think that was it. I think there were two takes. George Lucas didn't direct me up until I played another character. 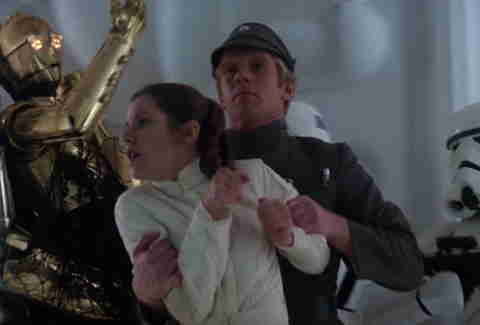 I was Lieutenant Sheckil in The Empire Strikes Back, because there was no one available. "Well, will you do it, Jeremy?" It was very much a "can we quickly get you changed to do this scene?" 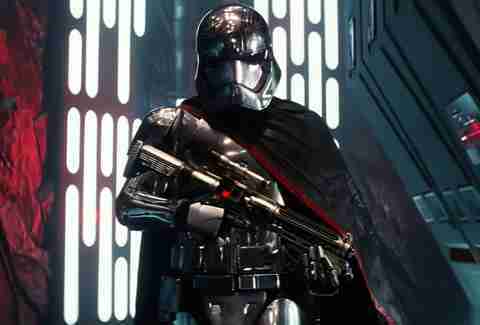 Then I played Captain Colton in the [prequels]. That was very kind of [George]. They called me up and asked if I would play it. It doesn't upset the storyline or anything like that, it's just that we need someone to do this scene, and nice that they chose me to do it. 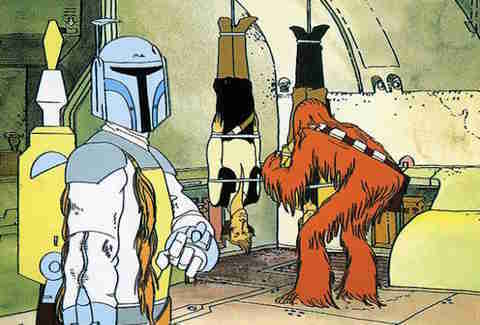 That was with the bounty hunters. They're all standing around, waiting. and put Captain Solo in the cargo hold. That was quite exciting. You felt really good in the outfit. I've just realized, these guys wear the most ridiculous outfits, but they are space beings, I suppose. But they're different. Leave them alone! Off the top of my head, I can name one: 4-LOM. I didn't get too much [direction], just that he's a soldier or a bounty hunter. You know, you see the different costumes, they're all standing there. You've got Irvin Kershner who is a great director, just huge fun. He sort of made it bearable in the heat, and he said, "We're finished with you shortly, so we'll get you out of that costume. Don't worry." I said, "No, I'm fine," because I didn't want to be seen being a ninny going, "Oh, it's awfully hot, can we have a break?" You don't do that. You just carry on filming until you're released. [George] didn't like the holiday special, I don't think. 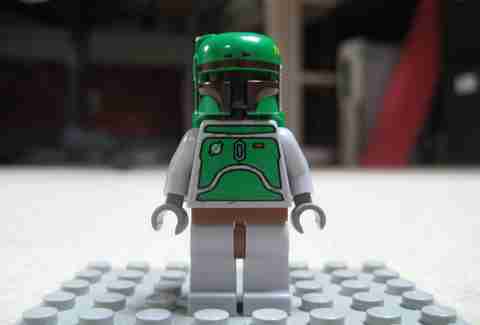 Actually I saw this sort of cartoon-type character, and I thought, "Well, that looks like Boba Fett." Well, it was. But it just didn't work. But at the end of the day, he needed to find something out. [Fox] rereleased the films on the big screen after the big success of Empire. I think it was then that he was becoming popular. 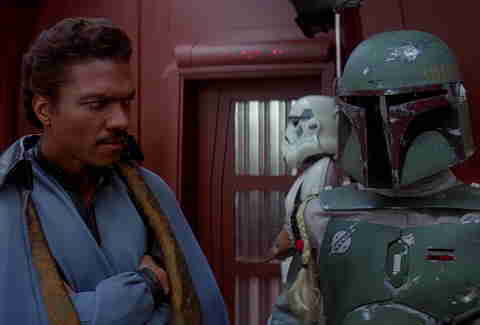 "Hey you -- you played [Boba Fett], didn't you? I knew it was you that played it." I said, "How can you know? I had a mask on." They had it on television for a while, but it's so much better to watch that film on the big screen. That's when I think Boba Fett was ​there. 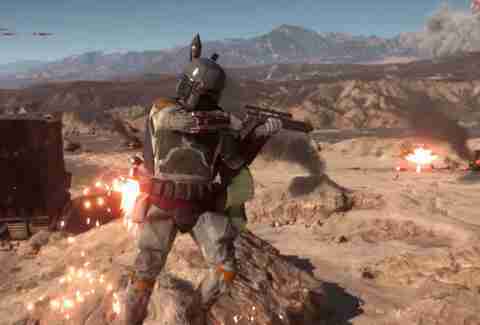 He was trying to be cool, as cool as he can, and [people would] say, "God, look at that -- ​that's Boba Fett." 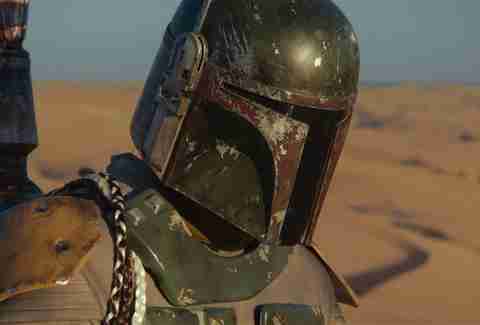 Was he happy with Boba Fett's haphazard death? Not really, but there's still a little tail-wagging there. Boba will be alright. He'll get out of this. If there's a problem, he can get out. He doesn't need help. He can do it himself. Apparently, he gets out of the sarlacc pit -- I haven't really kept up with the books because, to be quite honest, I haven't got the time. I'm always busy with something -- grandchild there, and that one there, and one over there. Occasionally I pick up and read a bit about it, but I'm not that serious, really. You can get the information off one of the fans. When they're all dancing, and there are the Ewoks singing, all the lovely dancing, I could see the cameras moving in to all the trees, like a long pan, and then it pushes back, and there you see Boba Fett just in the hedges, just watching. Just watching. That's all he does. Watch. I thought that would be a nice director's cut. Now, my wife and I saw that not that long ago, a bit of time ago. We saw that in the cinema near where we live, and we were the only two people in the cinema because everyone was at school. We got to watch that, on our own, with Pepsi-Cola, now I mustn't advertise, sorry... So it worked out perfectly. We just sat quietly, like two teenagers watching a film. It didn't mind me. I'll be there as Boba Fett. I can disappear and appear. I thought that it would be good that he can go invisible. Just remember who's the boss. [A spinoff] would be the time that it'd be nice to be invited to watch it. If this is the standalone movie: "Welcome, Jeremy." Hopefully, I'll get an invite. UPDATE: Actress Carrie Fisher, who played Princess Leia in George Lucas's original saga, passed away at the age of 60, after suffering a heart attack over the Christmas 2016 holiday.